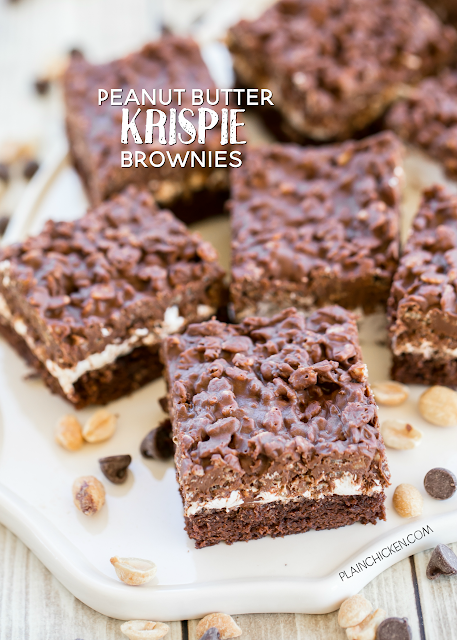 Peanut Butter Krispie Brownies - these brownies are TO-DIE-FOR! Boxed brownie mix topped with marshmallow creme and peanut butter, chocolate chips and rice krispies! These things are dangerous! Great for potlucks!! Seriously THE BEST! Such a great and easy dessert recipe. These Peanut Butter Kripsie Brownie are insane! OMG!! Brownies smothered in marshmallow cream and topped with a mixture of peanut butter, chocolate and Rice Krispies. Heaven in a pan! We had zero self-control around these brownies. I could hear them calling to me in the night - "Plain Chicken, Eat me!". LOL! My biggest tip for making these brownies is to line your pan with parchment paper before baking the brownies. You want the parchment paper to hang over the edges a bit. This will help you when you go to get the brownies out of the pan. It is SO much easier to cut them on a cutting board than try to mangle them out of the pan. 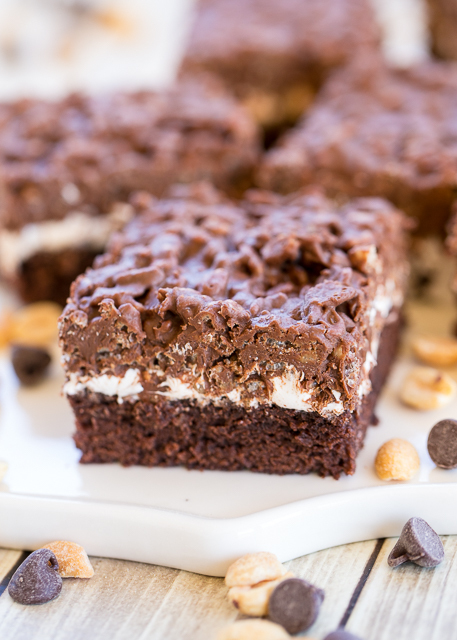 These Peanut Butter Krispie Brownies are great for a cookout, potluck, tailgating or a Thursday. SO, basically they are perfect anytime! I plan on whipping up a batch for Memorial Day. I know everyone will LOVE them! Line a 9x13-inch pan with parchment paper, making sure to have a few inches hanging over the edges. Prepare brownies according to package directions. Cool completely. In a medium saucepan over low heat, melt peanut butter and chocolate chips, stirring until smooth. Remove from heat and gently stir in Rice Krispies. Spread mixture over marshmallow creme. Cover and chill. Cut into squares. Yes, OMG!!! YUM! Will be making these tomorrow! These were so easy to make! I will find out if they are a hit tonight at our potluck! I think the only thing I may change is the Krispy layer as it does not seem to 'harden' so it is messy. Not sure if I did something wrong but I'll tweak it to see how to harden it...maybe less peanut butter.